The Moon is in Aquarius all day (until Thursday, November 19th, at 7:21 AM). 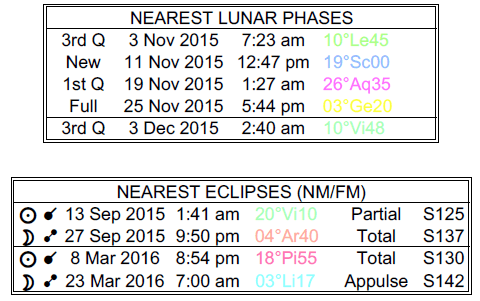 A New Moon occurred on the 11th, and a First Quarter Moon will occur early tomorrow. The day favors social activities, networking, reaching out to others, and entertaining new ideas, dear Aries. Neptune turns direct today, a yearly occurrence, and over the coming weeks, you’ll find that counting on your own intuition comes more naturally. Information and signals you receive are improved and more reliable, or it may be that your ability to process them increases. Believing what you hope is true can leave you somewhat blind to the reality of situations, but you can never truly deceive yourself. In fact, believing a lie that you’re telling yourself can wear away at your confidence in yourself, in others, and in life itself. Some realities may need to be faced this week, but you have every tool available to turn this into a positive. Your faith in the unknown as well as your desire to help others increases going forward. There can be a stronger awareness of your responsibilities today, dear Taurus, and a desire to push your life forward in important ways by getting your act together in some significant way. Today’s energies can leave you temporarily on the fence, but bring good energy for entertaining dream plans. Recent months may have found you wondering who your true friends are with Neptune moving in retrograde motion in your solar eleventh house. When you’ve needed a shoulder to lean on, you may not have found it, or you’ve ended up offering your own shoulder instead. With Neptune turning direct today, something that occurs each year around the same time, in the coming weeks, some of the confusion about friendships begins to clear up, or at least you are a little clearer about what to do about it. There may be some truth uncovered now that is a little hard to face at first, but that truly alters your course in a happier direction. Goals and alliances become clearer. Today’s energies favor envisioning your future, dreaming up new ideas, and imaginative activities more than they do practical affairs, dear Gemini. Fortunately, you can feel particularly inspired and optimistic now. With Neptune transiting your solar tenth house, your professional and public image may have been a little confusing as of late, possibly because you haven’t been in touch with what it is you’d like to project. With Neptune turning direct today, as it does around the same time each year, you might face some truths that may not feel completely comfortable at first, but that move your life forward in significant ways, particularly when it comes to career, life path, and reputation matters. Perhaps you hear from someone about gossip or opinions of you that don’t sit well with you. In the coming weeks, you are more able to make the necessary tweaks to your career and public image that improve your position. The only way to do so is to be as clear as possible. Don’t let others fill in the blanks and make assumptions. Correcting misconceptions is important now. This is also a good time for bringing more creativity, imagination, and idealism into the work you are doing. This can be a good day for putting concerted energy into a creative project or to apply some structure to your “play” time, dear Cancer. It may be exactly what you need at this time. Neptune retrogrades for several months and then turns direct each year around the same time. Today, Neptune’s direct turn can point to a turning point in a project or simply an attitude/faith. Your panoramic view of life returns to you now and in the coming weeks. Recently, you’ve been working closely with details – perhaps too closely – and you’ve been distracted from the larger plan or the bigger picture. This may have been a form of procrastination, as you haven’t had a lot of faith in moving ahead. There are always more details for you to sort out, but going forward, you’re more able to focus on the details that truly do matter. Faith in others, and in yourself, is rebuilding, making it easier for you to reach higher and dream bigger. For some of you, plans related to travel, education, or publishing can move forward. Today can stimulate a strong desire to pair up in some way, dear Leo, as you tend to enjoy having some company as you go about your day. With Neptune at its direct station, there can be some confusion or mental fog to deal with now, but it’s a good day for entertaining new ideas and dreams. In recent months, you may have been experiencing confusion about boundaries with others – what you own, what others own, what you owe, and what others owe – as well as with your own limits. You’re turning a corner regarding these matters now. While there are still quite a few details to sort out, you’ll be clearer on what you have and what you need, as well as what you are able to provide for yourself. You may have been feeling dependent on someone else, and haven’t had the energy or courage to turn that situation around, or even to know that you could do so. Days of procrastination on finances and dependencies are nearing an end. Money matters can move forward. 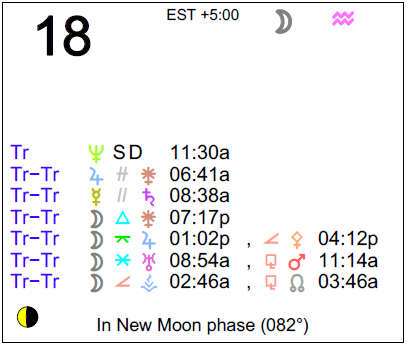 The Moon transits your solar sixth house all day, dear Virgo, and while this tends to stimulate your innate desire to make sense and order out of your daily life, today’s Neptune station can confuse matters somewhat. Neptune is turning direct as it does every year around this time, and while this tends to clear some of the fog, the shift itself can be slightly disorienting. At times in recent months while Neptune was retrograde, you may have felt at the mercy of the whims and moods of a significant person in your life, or others in general. Perhaps due to a decrease in energy or courage, you have let that part of your life slide. In the coming weeks, however, you are ready to face some truths and turn the situation around – not all the way, because you don’t want to be at the helm of a confusing situation, but around enough that you feel more comfortable. Things that have been taken for granted now get a second look. Be ready and willing to tend to small problems in your interactions so that they don’t have a chance to grow into overwhelming ones. The Moon transits your sector of creative expression and entertainment, dear Libra, and it’s a good time to let loose your more imaginative side. As well, Neptune comes to a station today as it begins direct motion as it does each year around the same time. Recently, you may have had some trouble keeping routines going smoothly. You may have also procrastinated on health matters or work that you haven’t seemed to be able to fully throw yourself into while Neptune was retrograde in your solar sixth house. While fixing the problem may have been difficult, in the coming weeks, you get insight into how to straighten out at least some of your daily affairs and routines. As you do, you’ll find that your overall mood changes significantly. You can choose to turn a blind eye to things, but somewhere inside of you, the guilt remains for letting them slide. As such, getting a handle on your work, health, and daily routines will help clear your mind and free you of burdensome guilt. The Moon is transiting your home and family sector all day, dear Scorpio, and there is a general tendency to stick with familiar people, places, or situations. It’s a natural time for tending to the hearth. 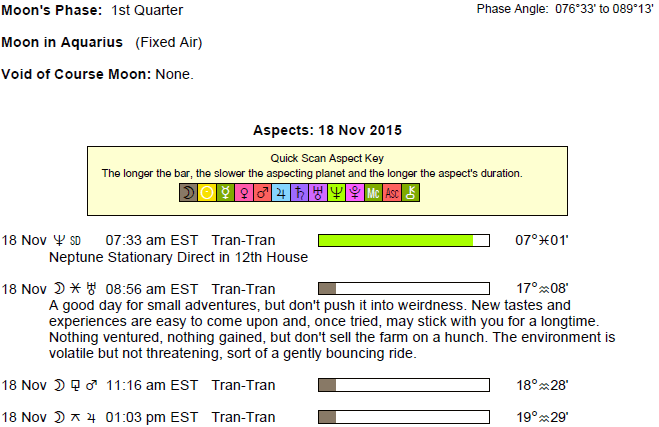 Neptune comes to a station today as it turns direct. While the shift itself can bring a bit of mental fog or confusion over the day, in the coming days and weeks, you’ll find that distractions become less of a problem, and you’ll get a better handle on those things that you’ve been avoiding or ignoring. Your love life or creative instincts may have been a little muddled as of late, particularly if you have been avoiding getting in touch with your heart’s desire. Signals you have been sending out have been mixed, so you cannot expect that signals received will be clear! Facing some truths may be part of the picture, but can act as a wake-up call to make important edits. Take the time today to reflect, and don’t ignore what your own inner voice is telling you. You’ll feel increasingly in touch with your intuition going forward, and more motivated to express yourself. The Moon is animating your communications sector all day, dear Sagittarius, and you’re a little more curious and communicative than usual. You’re inclined to scatter your energy a little, and this is fine as you feel out new ideas and interests. With Neptune at a station today, there can be some confusion or lack of concentration to deal with temporarily. Direction and focus may have been issues in your life in recent months while Neptune was retrograde, especially regarding all things revolving around family and home life. An introspective period that involved some delays and procrastination is now turning a corner. In the coming weeks, it will be easier and more intuitive to sort out patterns of conditioning and behaviors that have prevented you from moving forward. There can be some significant “eurekas” forthcoming. The inner “troubleshooting” that you’ve been doing will begin to pay off in the form of a stronger and more focused “you” in the weeks ahead. With the Moon in your resources sector all day, dear Capricorn, you can be especially tuned in to matters of comfort and security. Your desire to build upon what you already have in place is strong now. While practical affairs capture your interest today, Neptune’s station as it turns direct can point to some level of confusion or mental fog. This is temporary as we adjust to the shift. While Neptune has been retrograde in your communications sector in recent months, it may have been rather difficult concentrating on mundane or routine tasks. There is a greater need for your imaginative, intuitive side to engage in order for you to maintain focus and interest in what you’re doing. There is also more spontaneity in your thought processes and your speech, as you don’t always know in advance where your words or thoughts are taking you. Neptune turning direct today after months of retrograde motion can bring some misconceptions to light. There can be some restoration of faith in projects, learning, studies, and possibly relationships with siblings. The Moon transits your sign all day, dear Aquarius, stimulating stronger attention to emotions and personal needs, as well as a desire to feel connected to the world around you in meaningful ways. There is a dreamy theme to the day with Neptune, the planet of illusion, at a station as it turns direct. This event occurs every year around the same time. Dreams, visions, and intuition are powerful today, and could prompt you to act in unusual ways. Important truths are coming to light now that can stir up all sorts of mixed feelings, but help pave the way for personal changes that truly improve your life. You may have not had much faith in your ability to attract the right resources to you in recent months, or even to make the kind of living you want, but this is beginning to change with Neptune’s direct motion. Money matters can begin to move forward. Some of you could also feel more courage or inspiration to stand up for yourself and your values now and in the coming weeks. The Moon is transiting a hidden, private part of your solar chart all day, dear Pisces, and your more intuitive, introspective side is engaged. Neptune, your ruler, stations today as it turns direct after months of retrograde motion in your own sign. This brings a shift in attitude and perhaps some forward motion to projects or personal plans. Matters of personal image can emerge more strongly, and in the coming days and weeks, you are likely to feel more confident about making changes and tweaks that you have been considering. You could arrive at some new and improved ways of presenting yourself to others. You may have some slightly uncomfortable revelations regarding how others see you, whether it’s by way of direct or indirect feedback, but these provide you the chance to make some necessary and helpful edits. Your ability to lead will firm up now and in the coming weeks, helping to get you back into the groove of things. If Your Birthday is November 18th, If Today is Your Birthday full horoscope here.